Item number Na931 from the MOA: University of British Columbia. Print depicting the interior of an igloo with the yellow walls depicted in cross-section: at the centre is a woman wearing a decorated parka flanked by two children. Around the figures are a seal, a scraper, boots, a parka, and cooking utensils. Below the image is written, "Arnak Ilooviganituk lithograph 33/50 Dorset 1979 Eegyvudluk," and the name of the artist is written in Inuit syllabics. 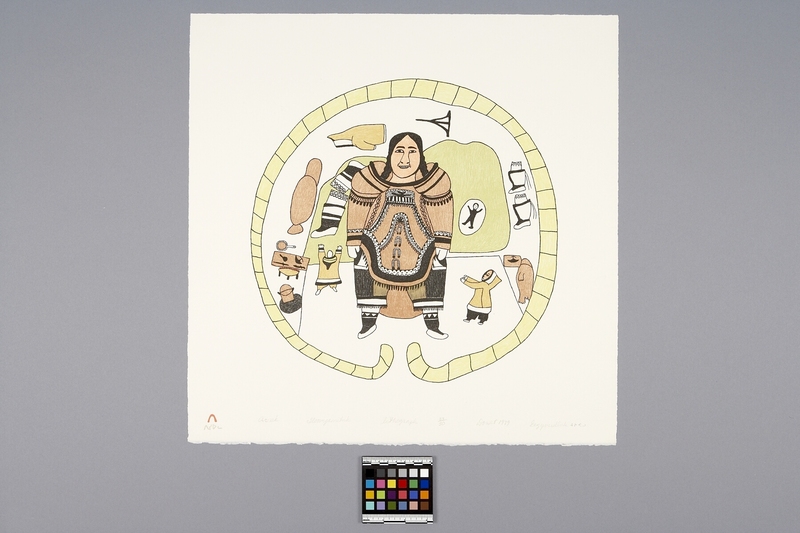 The name of the printmaker is printed in Inuit syllabics along with the Cape Dorset stylized red igloo seal in the lower left-hand corner. The Canadian Eskimo Arts Council and Cape Dorset Cooperative blind embossed stamps are in the lower right-hand corner.